At the Credentials step of the wizard, specify credentials of the user account for connecting to the server. The user name should be specified in the DOMAIN\USERNAME format. 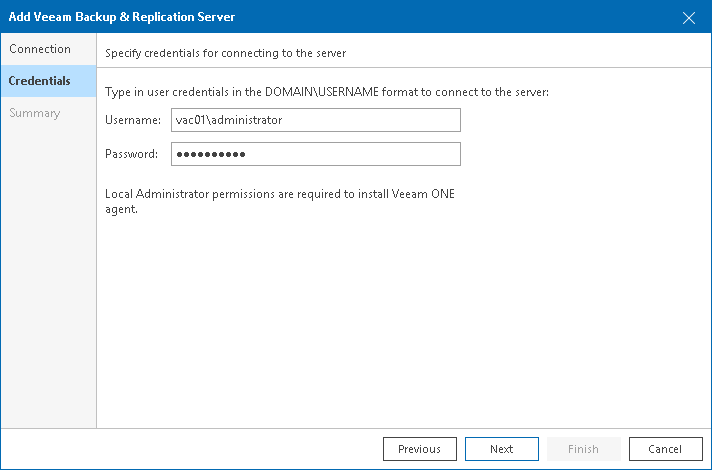 If the provided user account does not have required permissions on a managed backup infrastructure server, Veeam ONE will fail to connect to this server. In this case, you must provide custom connection credentials manually. For details, see Connection to Veeam Backup & Replication Servers.